It's adjacent to a variety of seasonal, waterfront outdoor activities and a short walk from the fun of both Olde City and Northern Liberties. 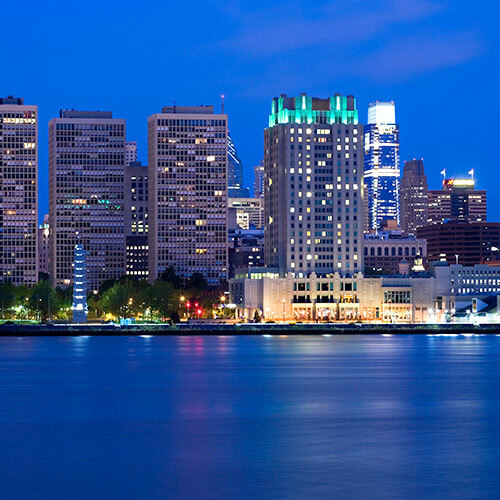 On the banks of the Delaware River, this 22-story high-rise in Penn's Landing offers large rooms with upscale bedding and stunning waterfront or city skyline views. During warm weather, enjoy a meal or a drink in the restaurant's outdoor dining area or wander into adjacent Spruce Street Harbor Park to explore pop-up food carts from local restaurants. During winter you can walk to the waterfront ice rink to enjoy some holiday cheer. Smoke free premises. 350 units. 22 stories, interior corridors. Accessibility (Call). Waterfront. Jct S Columbus Blvd and Dock St. Located at Penn's Landing-Delaware River. 201 S Columbus Blvd 19106. Station: 2nd.